Data and information concepts: to respect and accommodate the different developments in the acquisition and use of geographic information. The needs of societies are increasingly of global scale and require spatial data and information about their land, water and other resources – on and under ground – in order to monitor, plan, and manage them in sustainable ways. Spatial data and information, land administration, land management, and land governance play crucial roles in this. Spatial enablement is a concept that adds location to existing information, thereby unlocking the wealth of existing knowledge about land and water, its legal and economical situation, its resources, access, and potential use and hazards. Societies and their governments need to become spatially enabled in order to have the right tools and information at hand to take the right decisions. SES – including its government – is one that makes use and benefits from a wide array of spatial data, information, and services as a means to organize its land and water related activities. data and information to respect certain basic principles and to increase the availability and interoperability of free to re-use spatial data from different actors and sectors. 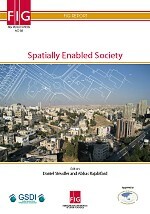 Land and spatial information professionals play a primary role in translating raw data into useable spatial knowledge resources. These professions should ensure that both the social and technical systems in which spatial enablement will operate within are well understood. Spatial enablement can only be effective when it is designed with the specific needs of the jurisdiction in mind. The concept of SES is offering new opportunities for government and the wider society, but it needs to move beyond the current tendency for the responsibility to achieve SES to lie solely with governments. SES will be more readily achieved by increasing involvement from the private sector, and in the same vein, if the surveying and spatial industries start to look toward other industries for best practices in service delivery. Presentation at FIG-Working Week, Rome, Italy, May 2012. Final Report to General Assembly, Rome, May 2012. Paper and Presentation at FIG-Working Week 2011, Marrakech, Morocco, May 2011. Paper and Presentation at FIG Congress, Sydney, Australia, April 2010.